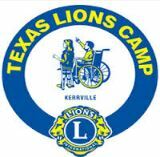 The primary purpose of the Texas Lions Camp is to provide, without charge, a camp for physical disabled , hearing/vision impaired, and diabetic children from the State of Texas , regardless of race, religion, or national origin. Our goal is to provide an atmosphere wherein campers will learn the “Can Do” philosophy and be allowed to achieve maximum personal growth and self-esteem. The Texas Lions Camp is recognized as a non-profit corporation, under section 501 (c) (3) of the Internal Revenue Service Code. The Camp is accredited by the American Camping Association, and is licensed by the Texas Department of Health.